From a whiny distant radio I catch this, "...Nobel of literature 2007...Mrs Doris Lessing." I don't believe it! That "nice skinner," as I've long called her? I prick up my ears, "...in 1976 was given the Medicis prize for The Golden Notebook." I did not even know that she had been translated into French. I only knew—out of sense—that whoever had read books by her in English couldn't help but regard her as one of the great flags of opposition to the system as well as opposition to the classic social pipedreams that have kept men, timorously hiding behind politics, government and law, from facing up their real destiny. An Arès Pilgrim she is probably not, but an "insurger" she is—only with something more, provocative and terrible, for which I can't see any necessity—with the meaning I "minted" the word "insurgence" into as "the Aresian soul's coin" (Many writings of mine on that theme). I've not read all of Doris Lessing's books, far from it, but I know two ot three things about her, which make us closer to each other. She was a Communist and I used to be so in the days when I discovered her from a book left on a seat on the Paris-Lyon express by some British tourist. She set to work writing not to be a writer, but to tell men about her experience of life and cry in substance, "You're all nasty pieces of work!" I set to work writing not to be a writer, but to tell men about a quite different experience, the Creator's, and add to the cries of Doris Lessing and all the denouncers of human evil, "Yes, you are, but you can change." She is not interested in pretty congratulations. I am not. She doesn't waste time worrying about nasty things and malice. I don't, either, because life is too short, is not worth dwelling on slanderous viciousness, while the most urgent thing is to show men that, even whenever they are not really mean, insignificant or repulsive, they are by no means up to their real metaphysical capability of love and eternity. I think that congratulators and carpers are just like roses and moquitoes. Today the former are fragrant and the latter biting, but tomorrow they will be no more. They never inspire the clear-headed world anything to help it create something new or simply evolve. She thinks so, only with different words. Although my own real-life experience and the real-life experience of Doris Lessing, ten years my senior, aren't like each other, they have poured down through the same human flesh like torrents. In their eddies the clear-headed man can mirror his own face, distorted, disappointing, but out of disappointment can decide to re-create himself different and have great expectations rising. 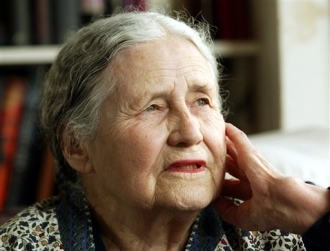 Would Doris Lessing be just "the emancipated woman," as the Nobel Academy says? To me she is much more than that, she is the emancipated human. When she was 65 years old and already an established writer, Doris Lessing did an interesting experiment. She sent a manuscript under a false name to her publisher, who sent it back as mediocre and/or unpublishable. She was awfully amused once more seeing the very great relativity of the world's values. Accordingly, I feel amused at the idea that I might have got an inverse result, if in 1974-1975 I had sent to the 47 publishers, that were all going to turn down the manuscrit of The Gospel Given in Arès (The Revelation of Arès's first part), in a false presentation, like a book having been cynically written by me instead of supernaturally received from Heaven. Some publishers could have responded positively.